From "Doom Loop" To Just "Doom": Italian Debt Faces A "Huge Structural Shift"
At the start of July, we revealed that a familiar force had returned to Europe. 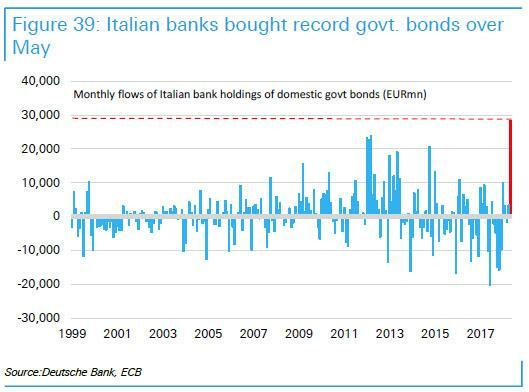 According to ECB data, during May when the market saw unprecedented Italian government bond turmoil, Italian bank holdings of domestic government bonds showed record buying over the month at €28.4bn, higher inflows than those seen during the European sovereign debt crisis of 2012. Visually, this is what the single biggest month of Italian bank purchases of BTPs in history looked like. This vicious circle of Country X banks (in this case Italy) buying Country X bonds during times of stress - with the backstop of the ECB - has for years been Europe's dreaded sovereign bank doom loop. And, as Italy clearly demonstrated, repeated and aggressive attempts by European regulators and policymakers to finally break the doom loop, most recently with the introduction of the 2014 BRRD directive, which sought which sought to remove the need for and possibility of bank bailouts, and instead ushered in bail ins, have been an abject failure. It is also a major problem. In a note published by Goldman on Wednesday, the bank's Italy analyst Matteo Crimella writes that "regulatory and supervisory changes, together with the risk of a deterioration in banks’ capital ratios/ratings owing to weaknesses in the sovereign market could, all together, raise the bar for domestic banks to step in as buyers." In other words, Italian lenders may no longer be as willing to snap up domestic government bonds during market stresses, something which Bloomberg calls "a potentially huge structural shift in demand in the euro area’s second-most indebted nation." "Whether domestic financial institutions will continue to act as a steady (and potentially increasing) source of demand for sovereign duration remains a fundamental question for the coming months – and potentially years. The forthcoming end of the ECB’s net QE purchases, together with the tendency of foreign investors to reduce significantly their exposure to sovereign debt in periods of heightened volatility (Exhibit 3), increases the need for a ‘marginal buyer’ of Italian BTPs", wrote Crimella, noting next what we showed one month ago, namely that net foreign investor sales of Italian long-term debt securities (including corporate debt) at about €33bn, most of it absorbed by the domestic financial sector. Meanwhile, investors have already started to ask question who the "marginal buyer" will be and with no answer forthcoming, they have been doing the only logical thing: selling, and as the chart below shows, yields on Italian 10Y yields have risen to levels last seen during the May crisis. While the doom loop - the risk weak banks that fund their over-indebted governments destabilize sovereign debt markets, and vice-versa - has long been a constant part of European sovereign debt reality, it was less of a concern when the ECB would purchase sovereign debt via QE. First, Italian banks are regulated by supranational authorities that are subjecting sovereign exposures to stress tests. That’s a signal supervisors “could be slowly leaning towards opposing the ‘home bias’ and making banks’ portfolios more diversified,” notes Goldman. Second, Italy, as ever, faces domestic challenges. Populist politicians appear determined to pursue an expansionary budget, fueling concern about debt sustainability. 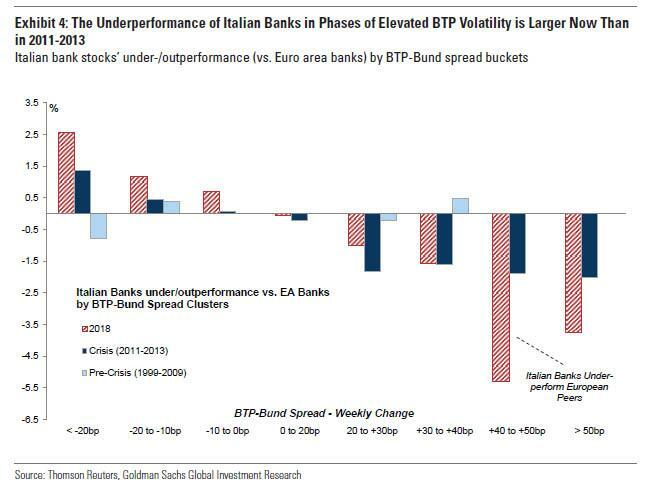 Growing doubts that the doom loop will remain viable pushed the yield spreads between 10-year Italian and German obligations to 286 basis points on Wednesday, approaching the widest since May, and as Goldman adds, "the Underperformance of Italian Banks in Phases of Elevated BTP Volatility is Larger Now Than in 2011-2013" even though there is seemingly no sovereign debt crisis in Europe as of this moment. Goldman then shows the performance of Italian banks relative to monetary and financial institutions in the Euro area during diverse government bond market phases. (iii) currently, the average under-/outperformance of Italian banks associated with ‘tail’ moves in BTP-Bund spreads seems to be higher than during the 2011-2013 crisis. The increased negative correlation (especially at the tails) "suggests that Italian banks are largely bearing the brunt of the current market turmoil, more idiosyncratically than in preceding and comparable Italian sovereign selloffs" Goldman writes, and adds that "the lower propagation of BTP volatility to other peripheral markets and the elevated exposure of banks to domestic sovereign risk, accompanied by the still elevated share of non-performing loans, may have amplified this underperformance, containing foreign equity spillovers." And, as Bloomberg adds, "in a stark reminder that the feedback loop is not yet fully vanquished, the capital hit due to Italian sovereign debt swings was higher than expected in the last quarter for at least two of the country’s banks." 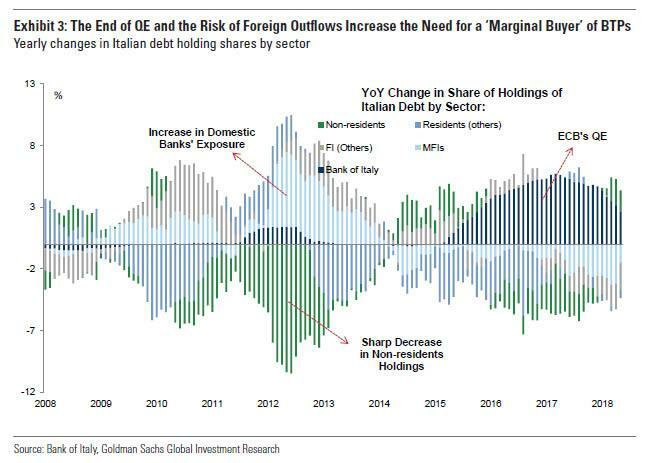 These considerations will make Italian banks more reluctant to buy domestic sovereign debt during times to turmoil, Goldman claims, and cautions that this disappearance of buyers comes at the worst possible moment: just as the ECB brings its unprecedented stimulus program to a close, eliminating Europe's buyer of last resort. And the punchline: just like the US, Italy is also hoping to expand its deficit spending, which would lead to even greater bond supply, and in an environment of declining demand, lead to a market that is acutely sensitive to even the smallest shifts in the supply/demand point, or as Goldman concludes, "the need for a ‘marginal buyer’ of Italian BTPs could increase, especially should the government pursue a bulky fiscal expansion, and any reluctance of domestic banks to fulfil that role could lead to a shortfall in demand." And since for Europe's second-most indebted nation this would be tantamount to sharply higher yields at best, and a default at worst, this suggests unless Rome finds another buyer of last resort to fill Draghi's shoes, in just a few months, Europe's "doom loop" would simply become "doom."